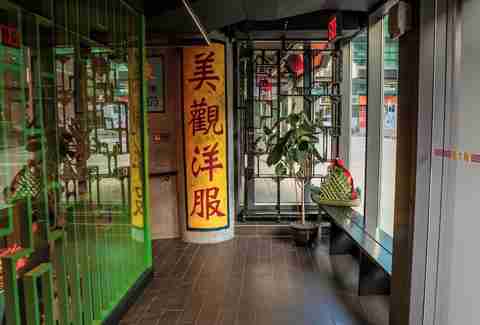 New York City is home to several Chinatowns, and it's a popular misconception that the best one is in Manhattan. While the neighborhood is home to plenty of restaurants, it’s largely filled with tourist traps serving dishes you can find in any town across the country. True Chinese food fans -- those who are hip to the spice, who are so indoctrinated in the cuisine that they consume chili oil more than any other supermarket condiment and can list flavor profiles by region, and maybe even province -- know that the best Chinese food lies mostly elsewhere (with a few exceptions) in neighborhoods like Flushing, Queens; Sunset Park, Brooklyn; and even Midtown. If you want the full experience -- the whole fish, the entire duck, the total spectrum of dishes and flavors, from twice-cooked to five spice -- you need to be eating at these NYC Chinese restaurants you’ve likely missed. New York bargain hunters are likely familiar with Prosperity Dumpling, the too-good-to-be-true, almost mythical dumpling joint that once dished out five dumplings for $1 and duck and sesame bread sandwiches for $2. Luckily, its successor, East Dumpling (which sits in the same tiny literal hole in the wall on Eldridge Street), is still economical, but a bit more believable with its three-dumplings-for-$1 deal. 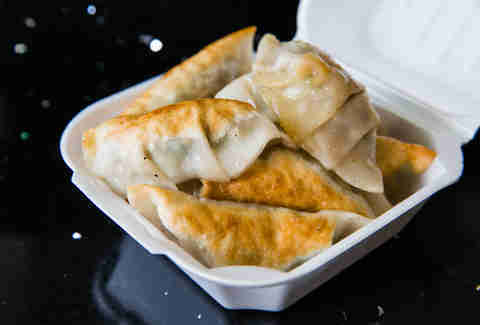 You could still easily get full for less than $5, but beyond the price, the dumplings are indisputably juicy and plump. 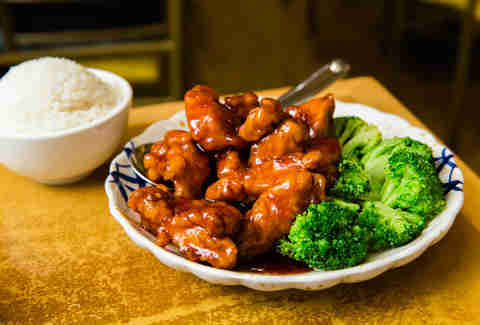 For those who have never expanded their Chinese food repertoire beyond sweet and sour chicken, Szechuan Gourmet is the perfect gateway to more authentic flavors. Located just blocks from Bryant Park, the fairly inconspicuous restaurant offers an array of traditional Szechuan dishes, most of which are doused in chili oil and Szechuan peppercorns to impart the cuisine’s signature mala flavor, which literally translates to “numb spicy.” Try the braised fish filets, which has a spice level denoted by four asterisks (so you know it’s serious). If you can handle additional heat, pair it with Chef’s Ma Paul Tofu, or balance it out with camphor tea smoked duck, which is at once smoky, crispy, and juicy. Very few restaurants are able to unlock distant memories for me, but Hunan House has such powers. The crispy shredded potato with vinegar sauce brings me back to my grandmother’s dinner table in Hubei province (which shares many of the same dishes as Hunan). The steamed ribs with taro transports me straight to Wuhan, China with my cousins. That is how authentic the menu is here. 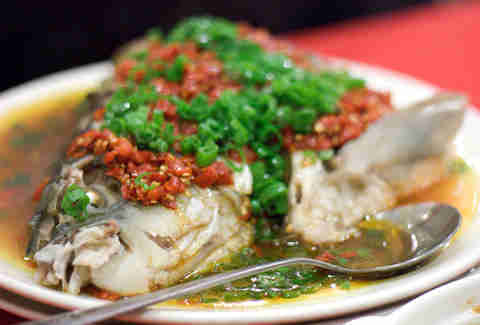 Try the spicy crispy fish Hunan-style or, if you’re feeling extra adventurous, the steamed fish head (you know, the part most people usually eat around) with chopped chiles. If that doesn’t sound adventurous enough, test your limits with the spicy green pepper with thousand years egg or sautéed stinky tofu with pork -- two traditional dishes that are notoriously polarizing due to their heavy fermentation. Though it’s extremely popular in China, Yunnan cuisine (known for its atypical dishes that include everything from banana flowers to various cheeses) has yet to really catch on in the States. 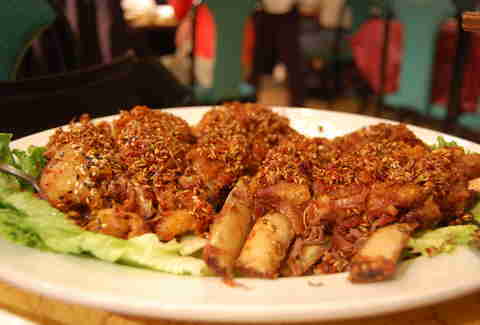 But in New York, the best place to experience it is Yun Nan Flavour Garden in Brooklyn. Located in Sunset Park (home to another one of New York City’s Chinatowns), Yun Nan Flavour Garden features an extensive menu of traditional noodle dishes, which come in two forms: with broth or without. The soup noodles come with generous chunks of meat while the drier version gets topped with minced pork and crispy peanuts. Be sure to try the region’s signature Crossing the Bridge Noodles, a hot pot-esque dish made with boiling chicken soup. One of the few standout options in Manhattan’s Chinatown, this Cantonese family-style eatery serves rare gems like ginseng and black chicken soup, a Cantonese delicacy that could scare off the more casual diner with its charcoal-colored chicken pieces, goose web (the webbing on a goose’s claw), and braised sea cucumber. But perhaps what makes the place so, well, amazing, is the menu’s nod to New York City’s deli culture, in the form of pastrami shrimp fried rice, pastrami over spinach, and corned beef over lettuce. Think of hot pot as the Chinese answer to brunch: The setup of a simmering broth pot surrounded by a wide assortment of raw ingredients is perfectly suited to dining out with a big group of friends. In some regions of China, hot pot is considered more of a lifestyle than just food. That’s the die-hard attitude that Mister Hotpot adopts across the ocean at its two locations, in Flushing, Queens and Sunset Park, Brooklyn. Every detail is taken seriously, from the broth base (choose from creamy pork bone soup, two herbal varieties, or a Thai-style tom yum seafood broth), to the meat (everything from beef brisket to king crab), to the vegetable accoutrements (popular options are lotus, napa cabbage, and mushrooms). True hot pot enthusiasts will know to also toss in some fish balls, tofu, and noodles for good measure. The number 88 is incredibly auspicious to the Chinese, as the character for “8” sounds a lot like the character for “prosper,” and two 8s together is doubly prosperous. But a potential windfall of fortune isn’t the only reason you should visit this dim sum spot located inside a barely marked mini-mall ripped straight out of China. Come for the steaming hot baos, the thinly wrapped shumai, and hard-to-find dim-sum items like fried turnip cake -- but most importantly, come for the fact that you’ll never find a long wait during peak dim-sum hours. Fu Run specializes in Dongbei cuisine, which hails from the Northeast (or dongbei) part of China and relies on pickling, heavier spices, and meats like cumin and lamb. 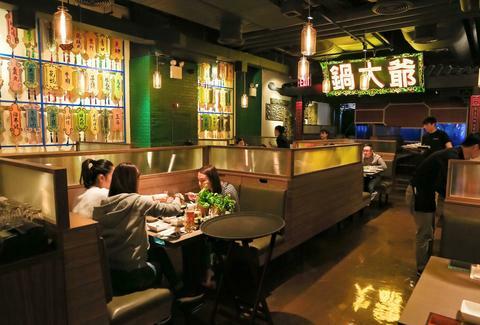 To try this hearty fare, head to one of the only Dongbei-style restaurants in New York -- Fu Run in Flushing -- where you can warm up with crispy lamb smothered in cumin and spices, fried fish in hot bean paste, and stewed sour cabbage with pork and vermicelli. Park Slope may be better known for its strollers than its Chinese food, but there is one glistening, red-chili-oil-slicked beacon in the heart of the Brooklyn neighborhood: authentic Szechuan. The menu caters to the masses with a full American-Chinese section, but those seeking the real thing should go directly to the house specialties and chef’s specials. There you’ll find double-cooked pork made with unctuous pork belly, chili-covered Chongqing chicken, sautéed lotus roots, and hearty fish stews that could compete with any Chinese grandmother’s recipe. Be sure to start with the cold cucumber salad, which has a surprising amount of flavor.